A coalition of more than 60 Asian American organizations filed an official federal complaint against Harvard University on Friday. The coalition requested that Harvard be the subject of a civil rights violation investigation on the basis of what the coalition is calling discriminatory admissions practices. At a press conference held Friday afternoon, coalition leaders said that holistic, race-based admissions policies hold Asian American students to higher standards than all other racial or ethnic groups. They called on Ivy League schools to eliminate the consideration of race in admissions decisions. In addition, the coalition said that Harvard University has an unlawful quota for the number of Asian American students it will admit. Michael Wang, an Asian American student currently enrolled at Williams College, said at the press conference that he was denied admittance to Harvard and other Ivy League schools due to his race, despite his excellent academic and extracurricular qualifications. “When our admissions offices set these standards and quotas, we don’t feel proud of being Asian anymore, and that’s not correct. See, all races should be equal to each other,” Wang said, adding that he filed complaints against Princeton, Yale, and Stanford but did not get the results he sought. 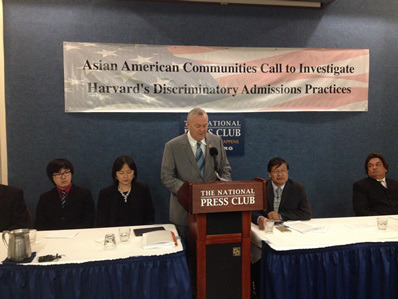 At the press conference, coalition leaders stated that Asian Americans have suffered the most due to Harvard’s holistic admissions policies, followed by White students, while some Blacks and Hispanics have received preferential treatment. Among the various critiques of race-based admissions posed at the press conference, coalition leaders argued that affirmative action policies do not actually benefit the intended targets of such policies—low-income, minority students. Coalition leaders said that, instead, affirmative action policies created a “privileged class” of middle-class Blacks and Hispanics in college admissions. Although no Hispanic or African-American groups signed on to join the coalition, Yukong Zhao, chair of the coalition organizing committee, said that he reached out to urban leagues and City Year, an Americorps Program. Regarding African-Americans and Hispanics, Zhao said, “We have a heart. We care about them.” Other coalition leaders expressed similar concerns about the limitations of poverty that are hindering educational and economic progress from some communities in the United States. Laura Yingying Sun, president of the Houston Chinese Alliance, said that she is involved with the Chinese American Relief Effort (CARE), which has been working with low-income schools in the Houston area since 1993. Each year, CARE chooses one or two local elementary schools where more than 90 percent of the students are economically disadvantaged, and donates a year’s worth of school supplies to each enrolled student. “We care about changing the opportunities [available] for everyone, not only Asian Americans,” Sun said. The coalition itself is a new entity, created in February 2015. Member groups come from all across the United States. The coalition appears to have strong ties to Students from Fair Admissions (SFFA), a group that is the plaintiff in a lawsuit filed against Harvard University in 2014. The lawsuit’s allegations are much the same as the coalition’s complaints, arguing that Harvard has a quota for Asian Americans, among other unlawful practices. Edward Blum, an affirmative action opponent, is orchestrating the Harvard lawsuit. He was also the architect of Abigail Fisher’s case against the University of Texas. Fisher argued that she was denied admittance to UT because of discriminatory affirmative action policies. At the end of the press conference, coalition leaders invited all Asian Americans who felt they had been discriminated against to share their complaints with them or with SFFA. A handful of political leaders have expressed support of the coalition’s goals. So far, those who have spoken out in favor skew toward the extreme right-wing. Congressman Dana Rohrabacher (R-CA) made an appearance at the press conference to say that he was in favor of the coalition’s goals. He noted that similar issues had come up 20 years ago regarding Asian Americans and affirmative action. Li said that coalition leaders met with Congresswoman Virginia Foxx (R-NC) prior to the press conference and plan to meet with others. Iuliano also noted that Harvard’s admissions process has already undergone an investigation by the U.S. Department of Education’s Office of Civil Rights and found to be compliant with federal law, following a similar complaint on behalf of Asian Americans. On Thursday, more than 130 Asian American and Pacific Islander (AAPI) groups signed on to a petition supporting equal opportunity in higher education. The petition was circulated days before the coalition press conference and is intended as a rebuttal to the coalition’s goals. At the press conference, representatives of Asian Americans Advancing Justice (AAAJ), an Asian American advocacy group, asked coalition leaders to sign the petition. Coalition leaders refused, saying that, until race is removed as a factor in affirmative action policies, they would not sign the petition. Coalition leaders also said that it is even more difficult for Asian American men to get into Ivy League schools than their female counterparts, indicating that Asian American men are subject to both racial and gender discrimination. They suggested that Asian American men might be the defendants in a future lawsuit. “This morning when we were meeting with Congresswoman Foxx, she did mention there might be a lawsuit on gender discrimination,” Li said.